Online, you can read a lot of reviews BlackBerry Classic, however, if you want to hear the responses of real users, you hardly can find them. Fortunately, our active user community BlackBerry VKontakte, ready to share with you my views. 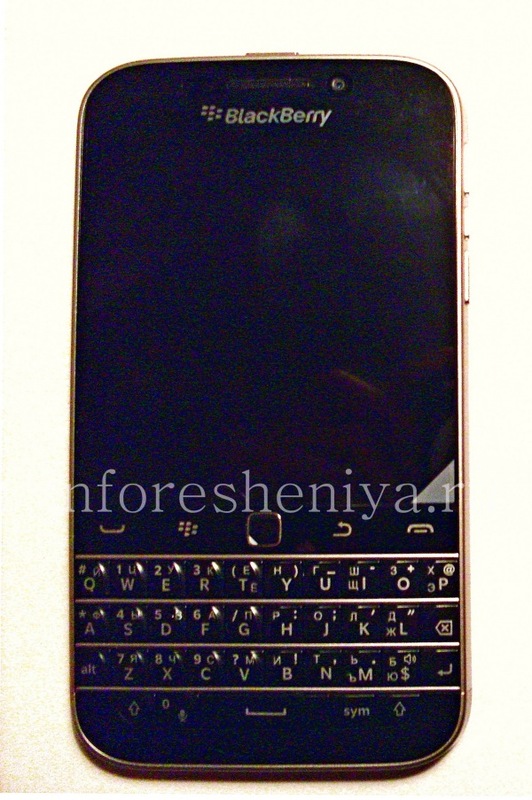 We, with the permission of the author ( Alexey Avdeev ), publish his review BlackBerry, or the first impressions of him. Community members can also read the original text . I bought the machine in your own online store, received a parcel on arrival at the hotel in the States. In rubles left in an area of ​​27 thousand. Phone seems heavy. For complete satisfaction we would like to weight percent to less than 10. The back cover is a nice, pleasant to the touch, do not need to constantly erase fingerprints, because they are not visible. Personally, I want a little more "rubberized", again, for a pleasant tactile sensations. Non-removable panel gave greater solidity phone. In the removable version, no matter how well the cover is not adjoined to the phone, still felt some soft touch by analogy with a twenty — phones for grandmothers, no, no, yes squeak something. Ideal. The Q10 is good, but there most of the buttons to press accounts directly with your fingertips, keeping them substantially perpendicular to the keyboard in the Classic without any problems, you can press a button more comfortable way, without twisting your fingers. Sami button longer — has never mistakenly did not press the next key. My advice to anyone who will buy in the future Classic, passport or any other Qwerty phone on BB OS 10.3 — discard the Cyrillic alphabet, which only clutter the native keyboard. Two options: either to write translit, or use the Russian keyboard layout from memory. Personally, I started with a transliteration and then I realized that well remember the location of all Russian letters. So I use it. Very comfortable and no landfills on the keyboard. I have to work a lot on writing letters and messages in any discomfort messengers — long texts do not cause. On the contrary, the more and more you print, the more comfortable it is to do — speed turns almost like on a computer keyboard. Dear God, thank you for you have heard our prayers — everything is very convenient! Further comment is superfluous. Even androidovskih applications until stocks to malfunctions with was not. The first minus. She braked. Not always, but sometimes. It is clear that when you photograph the remains of dinner for instagramchika — is not critical, but when you have managed to picture frame that will not be able to repeat — it is very unpleasant. I guess that cant tweak it in the next updates. Applications installed with Amazon are working without problems with Snap is not yet installed. VC set to BB World — Classics like the most is this application. 10.3, even ofitsialka works is not the best way. On the third day the phone itself is turned off once, twice had to restart due to freezing. Although after this works flawlessly so far.